The third in a series. The unofficial Marine slogan made popular by Clint Eastwood’s movie Heartbreak Ridge could just as easily serve as a motto for many rural emergency medical services in the Dakotas today. Despite the challenge of finding enough volunteers—or in some cases, because of that challenge—many departments have come up with creative ways to serve their communities better. Not all strategies have been tried yet, and not all have worked, but each one could be viewed as another step in learning how to create a sustainable solution. Unfortunately, innovating their way out of the crisis might require more time than many of these rural services have. Here’s an overview of a few of those ideas. Strategy 1: Allow EMTs to get part of their training online. One of the challenges in recruiting new emergency medical technicians is the time required for training: about 150 hours in North Dakota and 160 to 180 hours in South Dakota. The solution that Hericks proposed was allowing prospective EMTs to take part of their training online. And, after receiving approval from the board of the South Dakota Emergency Medical Technicians Association (SDEMTA), he was able to put such an online class in place. The online class format worked. Unfortunately, it didn’t solve Faulkton’s EMT shortage. Strategy 2: Pay EMTs, and offer more than just emergency care. The Frederick (S.D.) Ambulance Service had to give up its ambulance license in January because it could no longer guarantee 24/7 response with two EMTs. But Cole Adema, director of the Frederick Area First Responders (as they are now called), would like this to be just a temporary setback on the way toward providing a higher level of care for the community. One way to guarantee coverage is to pay at least one, perhaps two, people to serve the community during regular working hours when volunteer help is hard to find. Since Frederick’s 911 call volume would not warrant a paid position by itself, that person could provide other forms of health care that would prevent future emergency needs—helping people who have just come home from the hospital, for example, or checking that the elderly are doing OK in their homes. The first step would be forming a fire and ambulance taxing district, which would provide a greater and more dependable source of funding for those services. Currently, Frederick fire and ambulance are funded through donations from the city of Frederick and townships, with a small amount of money coming from county tax dollars. A taxing district would eliminate the city and township donations and instead fund fire and ambulance services through a mill levy paid by property owners. The first responders consulted with an attorney, who suggested that creating a taxing district for fire service would be a better first step than seeking a taxing district combining fire and ambulance. That vote will be on a ballot for the community to decide on this fall. Curt Halmrast, president of the North Dakota EMS Association and an Oakes (N.D.) paramedic, said paying EMTs is becoming more common in North Dakota. Strategy 3: Create great facilities to support volunteers. The Marshall County (S.D.) Ambulance Service was in need of a new building to house all three ambulances as well as provide a meeting room and training space for EMTs. The plans were drawn up which included all those needs plus two bedrooms and a laundry so the on-call EMTs had a place to stay and an office for doing ongoing paperwork. A fundraising campaign kicked off to raise the additional money needed for the $500,000 project. To everyone’s delight, more than $500,000 was raised and the new building is a reality, along with a new ambulance. Ambulance Committee member Josh Kraft stressed that the project is much more than just a place to house the ambulance service. Attracting additional EMTs is really what’s needed to keep the service operating well into the future. 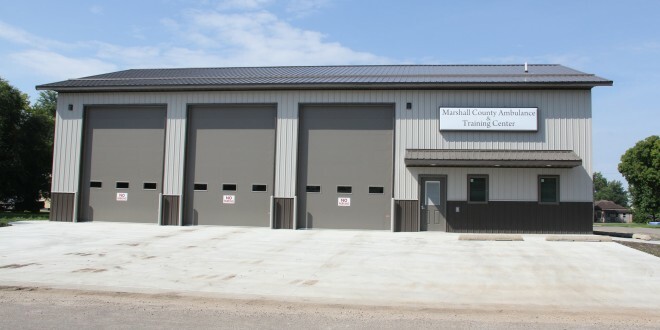 In Marshall County, the new building will help paramedics and EMTs can provide the fastest service by giving them the accommodations they need to wait near the ambulance. In other rural areas that covers many miles, where the limited number of volunteers have other jobs, waiting near the ambulance is not the best option. All of Frederick’s EMTs now have what amounts to an “ambulance in a bag”—all the things they need to start treatment as soon as they arrive on scene. This means they can either go to the station and bring the ambulance, or drive straight to the scene—whichever ensures the fastest response. Most of the EMTs carry the bags in their vehicles so they can just hop into their vehicles and go. The Frederick Area First Responders put together the bags without outside funding. They bought many of the supplies by working with Sanford, and so were able to buy many of the items at cost. “About the only thing we don’t have in here is a backboard,” Adema said. Adema added that other departments in the state are considering putting together their own similar kits, and he’s offered to share his supply list with them. Strategy 5: Consider legislative options. Years ago, when emergency medical services started, classes for EMTs took just 22 hours, but at the end of the class, EMTs could only use oxygen and take a patient’s blood pressure, explained Marilyn Rutz, director of Emergency Medical Services in the South Dakota Department of Public Safety. Now, classes take 160 to 180 hours, but EMTs know how to do much more. 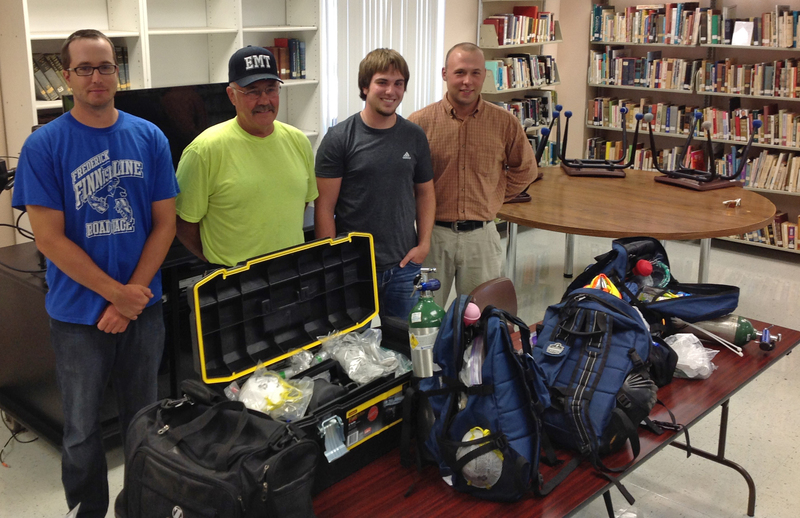 “EMS education & training is designed to give the best patient care possible,” Rutz said. Some rural EMTs have suggested, however, that something is better than nothing, arguing that perhaps regulations for EMTs in very rural areas need to be relaxed in some way, with less training required or looser rules about what training level is required of those who respond. Ambulance services are already granted hardship exemptions if they can guarantee that they can respond with one EMT and a trained driver, but those exemptions are temporary. Hecla, S.D., had to give up its ambulance license in July and became a first responder unit. Hecla’s mayor, Jay Osterloh, says the restrictions on what first responders can do could result in a life-or-death situation for patients. The rules for the training required for EMTs is based on national standards but actually written into state statute, according to Rutz. State legislatures could decide to make different rules to respond to the needs of rural communities with EMT shortages. For example, one option available in North Dakota is the use of substations, in which a community ambulance works under a headquarters ambulance service. These community ambulances are permitted to transport patients, but they do not have to be available 24/7, according to Tom Nehring, director of EMS and Trauma for the N.D. Department of Health. A legislative solution will likely require a clear vision and united voices. Finding examples to explain the gravity of the problem will be the easy part. See the first two stories in the series here and here. What do you think should be done about the EMT shortage? Add your comments to the conversation: Go to www.forum.dakotafire.net.